A couple of days ago I was sitting in the Hastings shopping center parking lot waiting for my son to come out of the store. Fortunately I had my camera with me and stepped out of the car to take this shot. Turned out there were others with the same idea. A woman parked her car few rows over and jumped out with her camera to take a picture. Then, I saw a guy put his shopping bags down to get a shot with his cell phone. Then, on the way home we saw someone set up on the Sierra Madre Blvd. median with a tripod facing west for pictures. It's always fun to see people taking pictures. Not so much to watch them, but to try to see what they see that is so interesting. There was no mystery here. Lately we've had spectacular clouds and sky well worth some pictures. Alligator lizard eggs hatch in late summer and early fall and it is about this time each year that I see these young alligator lizards with their amazing tails. So, there's my 2011 lizard post. A small crowd gathered Saturday afternoon for the grand opening of Mother Moo Creamery. Located on Kersting Court in downtown Sierra Madre, Mother Moo Creamery is the latest effort of local gourmet and master canner, Kathy Klemens, who is better known as Mother Cluck. The new store will be offering her ice creams, preserves and classes (this Saturday's class will be canning peaches). Here's the ice cream menu. I had the fresh mint with chocolate flakes and the triple joe. I sampled the cinnamon, ginger and salty chocolate. All were incredible. But, if I had to choose one, I'd probably go for the fresh mint and chocolate flake. I've had mint ice cream before, but never mint ice cream made with fresh mint. Wow, was it good! We'll be back. Now, here's the thing about Mother Moo Creamery -- in every sense of the word, this is a local effort. Mother Moo-Cluck is a local talent who makes the gourmet products she sells and offers them at events around town, including the Altadena Urban Farmers Market. She hires local folks -- my wife and son both knew people working behind the counter. And, as much as possible, she's using locally produced ingredients. On that score, the menu tells the story -- fresh mint and oranges from local farms and honey from Leona Valley in northern LA County. Mother Moo has great ice cream. And, they've got a strong Local Factor too. I hope you'll check it out. The In-N-Out on East Foothill is the oldest existing In-N-Out restaurant. This landmark neon In-N-Out sign was taken down a few weeks ago and apparently hauled off to HQ to be refurbished. The refurbished sign was reinstalled this afternoon and tonight it looks pretty good. The compact red and white In-N-Out drive throughs, the palms and, of course, the signs have become classic southern California images. East Pasadena's In-N-Out was built in 1952. There were a few In-N-Outs built before this one. But, the earlier restaurants have been torn down and rebuilt leaving this East Foothill location as the oldest standing In-N-Out. Memo to In-N-Out corporate: It is time to take the banner sign down from the roof.. The last two nights have given spectacular views in the Pasadena sky. The photo above is of the international space station as it orbited over us Saturday night about 8 pm. It was fascinating to watch. I was surprised at how fast it moved and how different it was from stars or planes or anything else in the sky. Pretty amazing stuff when you think that there's a crew of six orbiting the earth and living up there. The NASA website has a nice little feature that allows you to find out when the space station passes over a particular town. The station will pass over us again tonight (Monday) at 7:47 pm. Because of the heavy cloud cover and rain, we could not see the space station last night. Which brings me to our weird weather. The weather started changing late yesterday afternoon. A few raindrops fell and I spotted this rainbow to the east. We don't see a lot of rainbows around here, so I ran to grab my camera and got this shot before the rainbow was gone. Within an hour, rain was falling and then came some good rounds of thunder and lightening. Thunderstorms are forecast for today. Strange weather for us. With all this talk about sky, it seems an appropriate time to say thank you and best wishes to a departing Pasadena blogger -- Ben Wideman of the sky is big in pasadena. I followed his daily photo blog for much of its four year run. His blog frequently showed me aspects of my city that I hadn't seen or appreciated. In particular, his photos of City Hall were spectacular as were his shots of the Colorado Street Bridge and, of course, the local sky.. In his blog's last month, he listed his top 20 positive and top 10 negative things about our fair city. It was interesting to see the final perspective of this young Canadian who spent four years here preparing for the ministry. Friends and City Hall were his top two positive things; disparity between rich and poor and smog were his top two negatives. I'll miss Ben's photos and commentary and wish him and his family well. Every summer bears venture down from the mountains into our north-east Pasadena neighborhood. They are looking for food and every year there are reports of trash cans overturned or fruit trees raided. From what I've heard, few people in the neighborhood ever actually see a bear and even fewer seem concerned about the animals. Until this summer, I had experienced only one real bear encounter. Early one morning a couple of years ago, our dog surprised a bear who scrambled up a tree and then watched me while I took his picture. It was a fascinating morning. Well, this summer I had another bear encounter. Actually, our bees suffered the encounter and I just watched. Last year we kept bees without any incident. No such luck this year. Above is a photo of our little five-box high bee hive. The hive had been healthy and happy all summer buzzing along and making honey. At about 2 am recently I heard our dog barking and watched out the window as a bear stood on its hind legs, put its paws against the top of the hive and knocked it over. The frames spilled out and the bear gorged itself on honey. It was a sad, sad sight. Amazingly, though, the hive survived, was put back together and moved to a new home. Three years ago I posted a short biography of East Pasadena pioneer and famous artist, William F. Cogswell. I followed that with a post titled Mystery of the Missing Lincoln Portrait. You see, Cogswell had bestowed upon the City of Pasadena a replica of his most famous work -- the official White House portrait of President Abraham Lincoln -- but the City had somehow lost the painting. Just what happened to the painting is a mystery. Since the post, I've pursued the mystery with others. Sure, some know about the missing Lincoln portrait. But, no one has any theories about what happened. Then, a couple of weeks ago, I received an anonymous comment to my three-year old post. Anonymous reported that the Albion Castle in San Francisco has a replica of Cogswell's famous Lincoln portrait. Turns out Anonymous is right. I found photos of the Lincoln portrait hanging in the Albion Castle at flicker and foundsf. And, the portrait sure seems like a replica of the White House original (above). The Albion Castle was home to a less than successful brewery and seems an odd place for a Lincoln portrait. 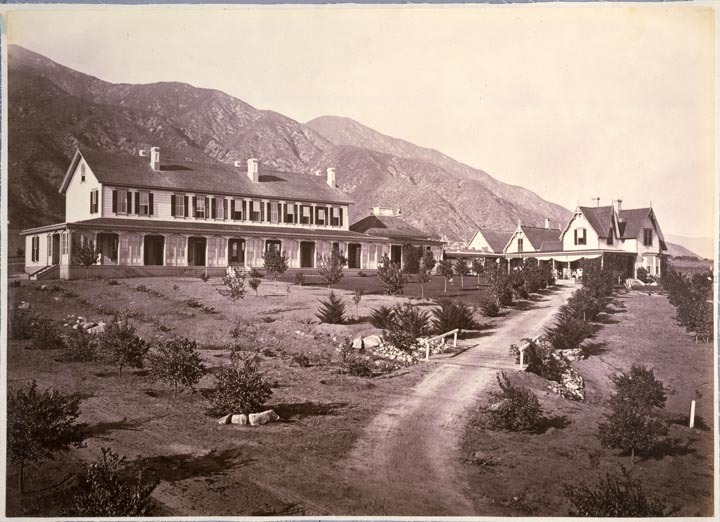 Could this be Pasadena's missing Lincoln? Anonymous -- What do you think? I reviewed my records and poked around the Internet to see if I could learn anything new about Cogswell's Lincoln portraits. How many replicas were out there? Certainly Cogswell was an enterprising guy and I knew he painted replicas of his famous Lincoln portrait for the Hawaiian Royal Palace, the California State Legislature and City of Pasadena. Were there more? It is hard to know how many Lincoln replicas Cogswell painted. The Pasadena PL has a 1961 letter from the Library of Congress stating that there were no records of Cogswell's Lincoln portraits. A 1932 LA Times article stated, without source, that Cogswell painted 13 Lincoln replicas for states and three additional replicas for individuals. But, I doubt the report. If there were really 16 replicas, it seems like I could locate more than three with a basic Internet search. Plus, Cogswell was a busy guy. Seems unlikely he would take time to do 16 replicas. So, is Pasadena's Lincoln hanging in the Albion Castle? Yeah, I'd like to know how the castle acquired the painting. It could be our painting. But, it is going to be hard for Pasadena to point much of an accusing finger. You see, Pasadena has a pretty strong track record of misplacing this painting. We know from Cogswell's obituary in the Evening Star that, as of 1903, a replica of Cogswell's famous Lincoln portrait hung in the Pasadena Public Library. But, we also know the painting was later removed from the library walls and placed in storage. Seems the library had trouble finding a suitable place for the life-sized portrait of the 6"4" tall Great Emancipator. Then, a February 7, 1932 LA Times article reported the painting had been found. 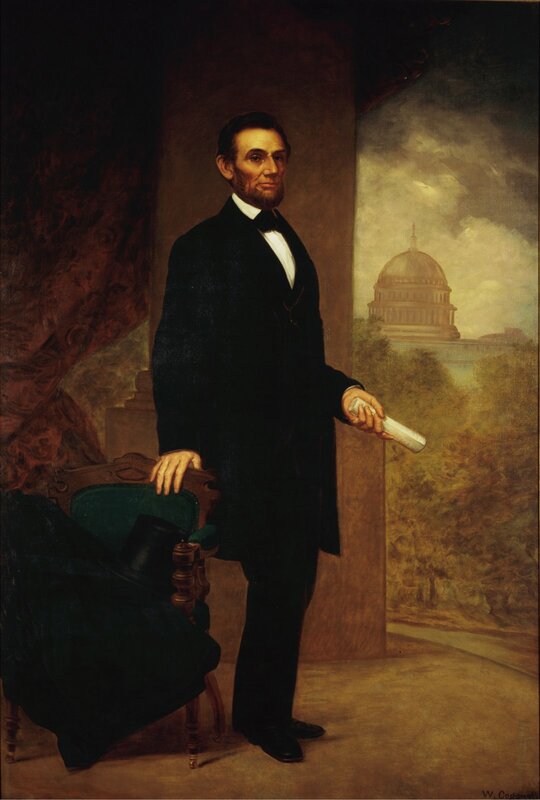 The article, titled "Rare Lincoln Portrait Found -- Rare Oil Painting Discovered in Pasadena," reported that the portrait had been found in the library's storage loft. The article stated the painting was in perfect condition and in a heavy gold frame. The article announced that the painting would be displayed at the opening of the new Pasadena Civic Auditorium. A 1961 letter from the Pasadena PL states that the Lincoln portrait was in the collection of Pasadena Historical Society. That is the last word I've found on the whereabouts of Pasadena's Lincoln portrait. Now, the painting is lost again. Hard to say how you misplace a life sized portrait of Honest Abe. But, Pasadena has managed to lose the portrait not once, but twice. My guess is the portrait is not hanging in the Albion, but probably still somewhere in the city. Maybe it is stacked in storage or hanging on a dark wall. But, most likely it is here --- waiting to be discovered yet again. There is a short stretch of fairly wild hillside land that runs along the east side of New York Drive directly across the street from Earthlink and the Eaton Wash Reservoir. I am often surprised at what I see there. I've seen deer enough times that I am always on the lookout for more. And I regularly see interesting and colorful plants and trees. Above is a cluster of Matilija Poppies pictured above. Dodder or Witch's Hair - a colorful but destructive parasite that is draping parts of the hillside..
Elder tree with yellow-white flowers. There are a number of Elder trees growing wild along New York Drive. I'll have more on Elders in my next post. First to the spider. I don't go looking for spiders. But, sometimes they find me -- or their webs find me to be more exact. And, when I run into them, after picking off the web, I can't help but think they are pretty amazing little creatures. One of the spiders I see around here is an orb-weaver -- meaning the spider builds a circular or wheel shaped web. The spiders seem to hang in mid-air with no conceivable support around them. The spider pictured above is hanging on a web secured on a tree about six feet to one side and a post about six feet to the other. It is hard to get a good picture of a spider web. This is a pretty good one. Here's our spider. She's hanging out in the middle of her web waiting for breakfast. OK. Now for the alligator lizard tail. Last night I saw the dog "playing" with an alligator lizard and went to check it out. Now the "play" here was all from the dog's perspective. The lizard had not chosen to play and, no doubt, did not want that instant to play. Anyway, the lizard so did not want to play, that it dropped its tail and scampered away. The dog, being a dog, was captivated by the flopping tail and allowed its playmate to escape. I reached the scene in time to take this short clip of the lizard tail wiggling around. I've found lizard tails and seen lizards with regenerated tails but I had not seen a newly detached tail still wiggling. Whether due to teenage whatever or lots of experience with detached lizard tails, my 13 year old was unimpressed. But, I thought it interesting and was glad to have my camera with me. We celebrated Independence Day in the traditional fashion -- BBQ and fireworks. What seemed odd, though, was the weather. July heat is not news. But, it sure seems that we are getting a lot more humidity than we used to. It was hot and cloudy last night out in Chino (where fireworks are legal and sold on nearly every corner). As we waited for the sun to set, it looked like someone to the west was getting rain. Watching my little girl scooter down the street to sleep over at her friend's house. Today I went to the new Vons on Sierra Madre and Colorado. I like the store. I like it a lot. For openers, samples are important in a grocery store. That's one reason why Trader Joes on Rosemead has been a favorite. In fact, around our house, TJ's is called "Samples." But, frankly TJ's samples have gotten a bit tired. Well, they had better take note -- the new Vons knows how to do samples! I had eight different samples including New York steak, sushi, chicken enchiladas, fresh pineapple, chips and salsa, jambalaya and more. My recommendation is to find the meat department for the steak -- it was really good. But, most of all, I like the design. I like the respect paid to our most dominant scenic asset -- the San Gabriel Mountains. The main Vons building is set back from Colorado and has as a central design feature a see-through arch that highlights the mountain views. This building was very plainly designed with the mountains in mind. Care to preserve and emphasize mountain views should be a signature design element for any new East Pasadena development. Too often building design ignores mountain views. For example, just east of the new Vons on Colorado is a hulking multi-story storage/office building that was built-to-the-street and obliterates mountain views. And the Sierra Madre Villa metro station seems to go out of its way to block mountain views. Hopefully any new building in East Pasadena will follow Von's example and give due respect to our mountain views. Great job Vons! Above is a little reminder that the mountain views from Sierra Madre Blvd. can be spectacular. The photo above is a winter-time shot taken a few blocks north of the new Vons. Now, the new Vons has rooftop parking, which is convenient. But it also provides unimpeded mountain vistas. In the short time I was in the parking lot I saw one photographer shooting toward the San Gabriels. I'm sure I'll be back to this store. Seems most every morning I'm greeted by the screech of parrots. Often they fly over our house. Sometimes, like this morning, they hang around the neighborhood screeching back and forth. This one landed in our eucalyptus tree and, on cue, gave me that quizzical parrot look as I sneaked up for a picture. Legend has it our local parrots are descendants of parrots that were let loose in 1959 when a fire engulfed Simpson's Gardenland and Bird Farm. The story is often recounted as "local legend" but, as legends go, it seems fairly well accepted. I know I've heard and read the story over and over since moving to Pasadena more than twenty years ago. Not often reported, however, is the legend's East Pasadena connection. You see, Simpson's Garden Town Nursery and Bird Farm was a long-time East Pasadena institution. On little more than a wing and a prayer, in 1928, Hal Simpson started his nursery. He had a $500 loan, a $55 Model T delivery truck, and moonlighted on odd jobs as his business took hold. Over time the business grew until it blossomed into a mall of sorts that included a nursery, florist, lawnmower shop, garden center, materials supply, and pet shop. Eventually Simpsons occupied a swath of land that fronted Colorado Blvd. east of Sierra Madre Blvd. and stretched north beyond the present-day 210 freeway. Billing itself as the largest and most diversified garden center in the West, at its height, Simpsons deployed 70 trucks and fielded calls on nearly 50 phone lines. Then, in 1959, fire hit. The nursery buildings, supplies and records were destroyed. According to legend, as the fire raged, the birds (including the forebears of our local parrots) were released. The birds were gone and a big part of his operation decimated. But, Hal Simpson got back on his feet and rebuilt. Customers stepped forward to pay accounts that were due even though Simpsons had no records. Simpsons remained an entrenched part of the East Pasadena landscape. But, in the 50's and 60's, East Pasadena's landscape was changing fast and Simpson's resurgence was short-lived. Eventually the State of California did what the fire could not. In 1968, the State took much of the Simpson property to build the 210 freeway. Forty years after he started, Hal Simpson was finished. But, the story's not over. Old Hal was not quite ready to call it a day. With proceeds from the State of California, he moved south. He bought a160-acre spread in East San Diego County and ... that old guy started over growing and selling plants. And, in 2011, Simpsons Garden Town Nursery in Jamul, California is operated by Hal's granddaughter, Cathy. Like her grandad, Cathy offers plants, and lots more, for sale. She has a pretty good website, too, with pictures of the nursery, gift shop and dozens of classic cars on display at Garden Town. Fittingly enough, Cathy's website pays homage to Garden Town's East Pasadena roots and beautifully tells the story of Hal Simpson -- a story that I've recounted above. Hard to believe it has been three years of East of Allen blogging. Time for a little reflection and maybe some "best of" posting. I started this back in March, 2008 to record some Eaton Wash and East Pasadena historical stuff. Then, in late April of that year, the Chantry Flat fire hit. I did a series of posts on what I was seeing here in NE Pas and closely followed altadenablog and several other Altadena and Sierra Madre blogs. The late great Foothill Cities blog tied the coverage together and, before I knew it, I was blogging. Since then, I've done about 180 posts, nearly all of them with photos. The historical posts are my favorites and they often take a fair amount of time. But, there are a few animal posts that I particularly like too. What posts have been most popular with visitors? The mouse wins. According to Google statistics more people have viewed a post I did on a baby mouse than any other East of Allen post. That's a little sobering given the work I've put into other posts. But, them's the facts. The bear, snake and alligator lizard posts are also particularly popular. Go figure. Posts about the Hastings Ranch Christmas lights have also attracted a relatively high number of views. If East Pasadena has a top attraction, it is probably the Hastings Christmas lights and, of course, post Rose Parade float viewing. It has been fun to get emails from people who are interested in something I've posted. I received some interesting correspondence from collectors following my post about the famous portrait of President Lincoln that is mysteriously missing from the Pasadena Public Library. And, I've received a number of emails about my St. Luke's posts -- some from people who were born at St. Luke's, one from a producer and others interested in the proposed St. Luke's development. The series on Earthside Nature Center was plain old fun to do and also elicited some interesting feedback from persons who knew the garden's founders. So, now I have a new category called "highlights" and may in the coming months re-post some of my own highlights from this blog. Altadena Urban Farmers' Market just keeps getting better and better. It is not your usual farmers' market or street fair. In fact, it's not your usual anything. Sunday's market was the best yet. About 30 local vendors came -- all offering homemade local food and goods. Then there were the goats (including two babies), chickens and historic venue. On top of that, there was the Farmers' Market University offering lessons in making cheese, bread and home cleaners. And there were a lot of people. I thought my photo of the crowd was pretty good -- that is until I saw Petrea's artistry at Pasadena Daily Photo. Of course, she found a mother and daughter strolling under an archway. It was good to see her and John at the market. Actually, I saw a lot of folks I knew. The market is is taking on a bit of a Main Street flavor where you encounter not only local produce and goods, but bump into friends as well. We were there with Marcia's homegrown enterprise, HomeBody Botanicals - offering herbal body products she makes with local and organic ingredients. She was non-stop busy for all of the three-hour market and is seeing repeat customers, which is gratifying. This little market that started just last October has quickly become a hit. As you walk the market, you get the sense that there is a pent-up desire for this kind of thing. Yes, folks are discovering something new. But maybe it is more. Maybe they're finding something that was long ago misplaced. The market is certainly part of the trend toward localism. Altadena shop owner Lori Webster talked about this recently in her excellent blog. She's on the front lines of retailing and observes that the trend toward localism is "huge and growing." May the trend continue. Victory Park was dedicated in 1952 as a memorial to those who fell in World War II. As I've done since 2008, I post a photo of the V shaped rose garden at the corner of Altadena and Paloma, and the flagpole with flag at half-mast. This year I wanted the photo to include more of the park and mountains so you have to enlarge the photo or look closely at the lower right to see the rose garden. The base of the flagpole has a plaque provided by the Gold Star Mothers inscribed "In remembrance of those who made the supreme sacrifice during World War II." Today is a day to honor those brave men and women who gave the ultimate sacrifice for our nation. It is a day to remember. 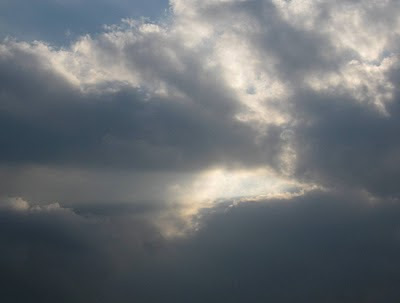 I commend to you excellent Memorial Day posts at Sierra Madre Tattler, Pasadena Latina, Glimpses of South Pasadena, and the sky is big in Pasadena. As always, it is a good day to visit The Wall. Also, in one of her best mystery histories, Pasadena PIO has posted the story of how the city's efforts to build a war memorial led to the founding of Victory Park. There are some great park photos there going back to 1952. For a week or more we've noticed geese on the grass in front of PHS and in the Sierra Madre Blvd. median. This morning I saw these two geese resting on the median in front of the Home of the Bulldogs. With all the traffic and commotion, I can't imagine why the geese choose the median as a resting place. But, they seem unruffled by the cars whizzing by and perfectly able to relax. 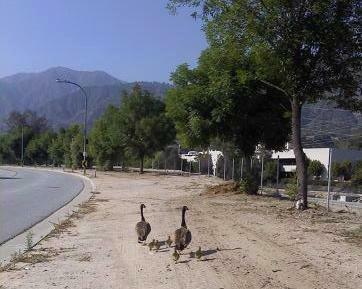 Last year my son got a shot of two geese and their goslings walking along Washington Blvd. on the east side of PHS. This photo was taken May 5 a year ago. Makes me wonder if goslings are in the future for the pair sitting in front of PHS this year. Geese are apparently one of the most talkative animals (after humans of course). Not sure how all this works but baby geese begin communicating with their parents while still in the egg and scientists have identified 13 different goose calls with different meanings. If anyone knows about geese -- what they eat, where they nest, ect. I hope you'll leave a comment. Get out and vote today for city council and school board. I was out early to Hastings Library. This election is particularly important for East Pasadena since we elect a new person to represent us at City Council. I'm told it will be a close vote. I enjoy voting and always go to the polls on election day. Just my observation, but voting doesn't get the respect it deserves -- from the people all the way through the government. Maybe it has always been this way. Maybe I'm just noticing it more. Like the flag at the library this morning -- duct taped to a plastic pole and hanging from a nail driven into a sycamore. C'mon folks. Duct tape and nails in trees? We can do better than that. The view from Hamilton Park this afternoon. That's the Pasadena Nazarene Church in the left foreground and the San Gabriel Valley stretching out below. I took my camera to softball practice because I had a feeling we would have some great views. We did. Downtown Los Angeles between the trees. District 4 City Council Race: Fosselman or Masuda? Local elections are generally easy for me. This one wasn’t. I had to do my homework before the better candidate became clear. I’m voting for Jill Fosselman. Between the two candidates, she will be the most effective advocate for East Pasadena. You can see some of my interests on this blog – our mountain views, East Pasadena history, city planning, local wildlife, St. Luke’s, Earthside Nature Center, and the long-planned but never built Eaton Wash trail. Like most reasonable folk, I’m frustrated by traffic, want neighborhoods protected, development limited, and our quality of life maintained. I’m interested in other issues too. But, planning and development rises to the top of my concerns when picking between these candidates for city council. I want the person who will be the best advocate for East Pasadena on these issues. Over the next four years a number of decisions will be made affecting the future of East Pasadena. Plans will come forward to develop the St. Luke’s property. There are a number of vacant properties that could attract attention, such as the Hastings Theater and car lots along East Colorado. And, it seems existing growth limits are up for grabs. The city’s General Plan is being revised and city staff has put forth four alternative directions. As described in the most recent In Focus, one of the alternatives is to shift growth from downtown to East Pasadena and other business districts. Coincidentally, specific plans that govern growth in our commercial areas will soon also be revised. Now, it would be nice if our next councilmember could simply say “no” and the move to shift development to East Pasadena would quietly disappear. But, that’s not how it works. Our new councilmember will be one of eight votes on city council. To win on any issue, a councilmember has to be able to combine his or her vote with at least four others. That takes an advocate – someone who is well prepared, can discuss the issues from many perspectives and can articulate their position in a compelling fashion. There’s an added challenge for the East Pasadena representative. Out here, we’re kind of the “Un-Pasadena” -- the suburban eastern flank to a historic and very urban city. Historic Pasadena sometimes just doesn’t understand us. Then, there’s the fact that East Pasadena is more spread out than the rest of the city. We have parking lots with free parking and few high rise buildings. We like the elbow room. But, to many across the city, our elbow room reads development opportunity. I think Fosselman is East Pasadena’s best choice to send into the fray at City Hall. I’ve spent some time with her and I’m impressed. She understands the the issues in the kind of detailed way that’s needed to win arguments at City Hall. She’s articulate, energetic, and passionate about East Pasadena. I’m also impressed with the company she keeps. Prior to serving on the General Plan coordinating committee she was part of the Coalition for a Common Vision which was a distinguished group of local citizens who took a critical look at city planning. I’ve worked alongside many in that group and they have long been in the vanguard of Pasadena movements for wise planning and open space preservation. Fosselman has run with the big dogs. I respect how Gene Masuda has involved himself in the community over the last four years, but have trouble projecting him as an effective member of city council. I met him several years ago when both of us opposed the proposal to build storage units on the Edison right of way. While I appreciate Masuda’s community activities, I do not see in him the level of knowledge, insight and skill that I see in Fosselman. When plans are debated at City Hall, you can be assured that a myriad of interests will be well represented by skilled advocates. As for East Pasadena, we get one person to represent us in the debate. The decision of who will represent East Pasadena is vitally important to the future of our part of the city. I suppose you could construct a sort of acid test for deciding between the two candidates. The test would look something like this: imagine you lived in a quiet neighborhood that happened to be adjacent to a 13-acre property that is now largely vacant. The property has been sold and development plans are soon to come forward. Obviously, the development could dramatically affect your neighborhood. Between our two candidates, who would you choose to represent you at City Hall? Well, the acid test is real. That’s exactly the situation faced by the neighborhood south of St. Luke’s. Leaders of that neighborhood have already beaten back a proposal to build hundreds of condominiums on the site. They know new proposals for the St. Luke's site are around the corner. They are supporting Fosselman. It is the bottom of the ninth inning. The East Pasadena team is on the field. It has been a hard fought game and we are ahead by just one run. The bases are loaded and the opposing team’s best hitter is coming to the plate. We have Fosselman and Masuda warming up in the bullpen. Who gets the call? I give the ball to Fosselman.